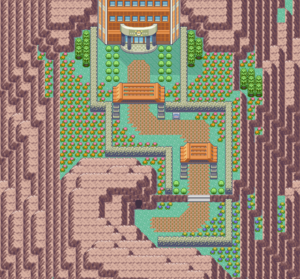 The upper part of Ever Grande "City"
The top part of Ever Grande City includes the Pokémon League and the largest Pokémon center in the game. Two Cool Trainers block the way to the league, they will only let you pass once you show them your eight badges. The center is the same as any other but supersized, it even has its own Poké Mart on the right side of the building. Make sure you get all the Pokémon you want to use for the league and heal them. This page was last edited on 28 November 2018, at 03:02.